ORS is proud to provide Licensed Athletic Trainers (AT) for most of the area high schools. 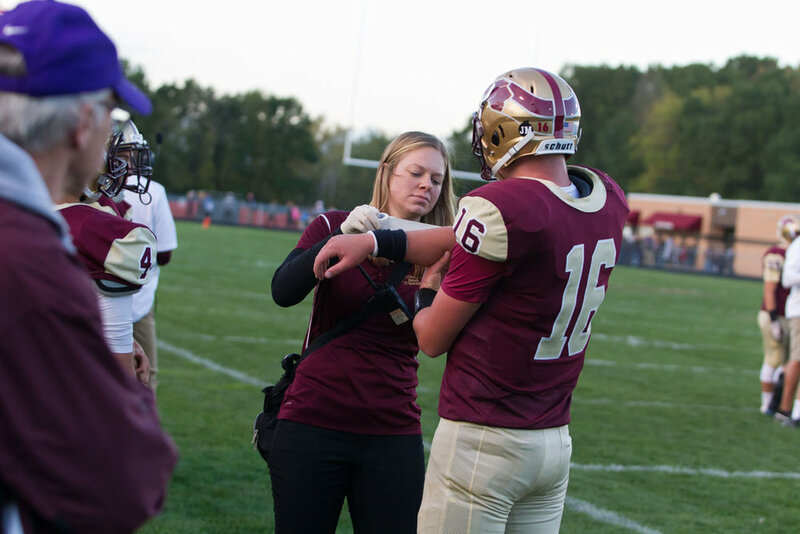 Athletic Trainers are medical professionals that have a wide range of knowledge that helps to keep student athletes safe and on the playing field. They are trained not only in the initial assessment and care of your everyday injuries, but with the management of major catastrophic injuries as well. A licensed Athletic Trainer's job doesn't stop there. It can include injury prevention, rehabilitation, and knowing when a referral is necessary. At Orthopaedic Rehab Specialists, there is a distinct advantage to working with our Athletic Trainers. ORS has many different subgroups which keeps all of our Athletic Trainers up to date on information in regards to concussion management, emergency response, and even performance training. This, in turn, keeps the ORS Licensed Athletic Trainers at the top of their game and allows them to provide the best care possible. The connection with the many area Physical Therapists and Physicians also allows for better communication between all of those who are active in the student athlete's care, and can result in the athlete receiving the best, overall care and back on the field in the safest, quickest, most effective way possible. Licensed Athletic Trainers are highly educated and skilled professionals specializing in athletic healthcare. In cooperation with Physicians and other allied health personnel, the Athletic Trainer functions as an integral member of the athletic health care team in secondary schools, colleges and universities, sports medicine clinics, professional sports programs, and other athletic health care settings. Athletic Trainers can be employed with performance art companies, military settings, industrial settings, as well as sports settings. Athletic Training is recognized as an allied health care profession by the American Medical Association. Our Licensed Athletic Trainers have, at minimum, a Bachelor’s Degree, usually in athletic training, health, physical education, or exercise science. They are Board Certified (designation ATC) and Licensed by the State of Michigan (designation AT). The Athletic Trainer’s main function is to keep individuals participating at a high functional level, whether in athletic, exercise, or work-related activities.